UCF extended its winning streak to 17 games on Saturday with a 45-14 win over Pitt. 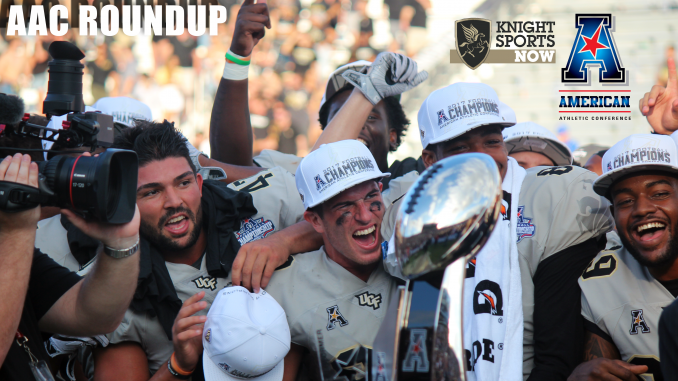 The Knights (4-0, 1-0 AAC) moved up a spot to No. 12 in this week’s AP Poll and get back into conference play this Saturday against SMU. Before we get there, let’s take a look at what else went down around the AAC in week five. For all of the worry about the Knights’ strength of schedule in the first few weeks, there seems to be a bit of a revival as of late. The teams on their non-conference slate haven’t done much to help strength of schedule, but the AAC, and the AAC East in particular, is more than helping out. There are three undefeated teams in the division, with UCF being one of them. That could make the month of November daunting. Games with Temple and Navy to start the month may be tricky in their own right, but then the Knights have to play host to Cincinnati (currently 5-0) before traveling down I-4 to take on South Florida (currently 4-0). That won’t be too easy for Josh Heupel and his team, but if things work out, it would be an impressive run for the defending champions. UCF still has to be the favorite in the AAC East, considering it hasn’t showed anything to say otherwise. But the Bearcats and Bulls are right behind with a chance to unseat the Knights. It was only two years ago that a South Florida team with a 7-1 AAC record missed out on the title game because of a loss to Temple, who was also 7-1 but held the tie-breaker. The AAC West is Houston’s to lose, though Tulane showed that it could be in the mix. It’s also too early to count Navy out, but an 0-2 start to AAC play is probably enough to put Memphis on the outside of contention.